Although Americans are becoming more aware of the prescription drug abuse epidemic, drug overdoses are killing more people than ever before. A recent public health study found that more than half of individuals who are prescribed an opioid pain medication never finish the prescription. Another U.S. government report shows that more than 70 percent of people who misuse prescription drugs get them from their friends, relatives or simply take them without asking. Attacking the problem of prescription drug abuse takes a multi-faceted effort. Here is what you can do to help. The Drug Enforcement Administration (DEA) has announced that the 17th National Prescription Take-Back Day will be Saturday, April 27, 2019 from 10:00 AM to 2:00 PM. The Take-Back Day provides a safe, convenient, and responsible means to prescription drug disposal, while also educating the public about the potential for abuse of medications. Since the DEA began hosting the National Prescription Drug Take-Back Day in 2010, 6.3 million pounds of medications have been collected for safe disposal. It is important to get rid of old and unused medicines as soon as you don’t need them. Some medications can become dangerous or ineffective over time. Other medicines can be abused by someone searching through your medicine cabinet. Prescription drugs thrown in the trash can be retrieved and abused or sold illegally. Young children can also be poisoned by unused medication. On the National Prescription Take-Back Day, communities will be sponsoring take-back sites. Call 1-800-222-1222 and poison center nurses and pharmacists will be able to answer your questions and help you quickly locate the nearest site. Please keep in mind that many pharmacies will take back unused medication every day of the year. If you aren’t able to return medications on the National Prescription Take-Back Day, you can call the Poison Center for pharmacy take-back sites year round. The FDA has been receiving voluntary adverse experience reports about tobacco products since 1988, including accepting online reports since 2014 via the Safety Reporting Portal (SRP). Consumers have also reported adverse experience information directly to poison control centers. Since June 2018, the FDA observed a slight but noticeable increase in reports of seizures. After examining poison control centers’ reports between 2010 and early 2019, the FDA determined that, between the poison control centers and the FDA, there were a total of 35 reported cases of seizures mentioning use of e-cigarettes within that timeframe. Due to the voluntary nature of these case reports, there may be more instances of seizure in e-cigarette users than have been reported. Did you know the Nebraska Regional Poison Center as well as all poison centers across our nation never close? In 1961, Congress established National Poison Prevention Week to raise awareness, reduce unintentional poisonings, and promote poison prevention. Each year, more than 2 million poisonings are reported to the nation’s poison centers, which can be reached by calling 1-800-222-1222. Most poisoning deaths are due to misuse and abuse of drugs, but poisoning exposures can involve a vast array of substances such as household cleaning products, personal care products, chemicals, bites and stings, pesticides, plants, gasses and batteries. Poisonings happen every day in every age group. The Nebraska Regional Poison Center will unite with the nation’s other 54 poison centers to celebrate the 57th Annual National Poison Prevention Week on March 17-23, 2019, a week dedicated to raising awareness about poisoning in the U.S. and highlighting ways to prevent it. Be sure to read and follow medicine labels every time. Never share your medicine with others or use someone else’s medicine. Remember to always use the dosing device that comes with the medicine. Take only one medicine at a time with the same active ingredient. Store all medicines up and away and out of reach and sight of children. Teach children to only take medicines with the permission and guidance from a parent or trusted adult. Install and maintain carbon monoxide detectors in your home. Be aware of where the disc batteries are in your home. They may be found in remote controls, key fobs, watches and toys. Keep batteries away from children! Make sure all cleaning materials, including laundry packets, are stored in original containers and up and out of sight of children. It is important to get rid of old and unused medicines as soon as you don’t need them anymore. There are pharmacies that take back medications year round. The Poison Center will help you locate the pharmacy nearest you. Text “poison” to 797979 to save the contact information for poison control in your smartphone. The Nebraska Regional Poison Center is a free community service to the public. Registered Nurse or Pharmacist 24/7/365. Poisonings are a leading cause of unintentional injury death in the U.S. While the majority of poison-related exposures occur in children under 5 years of age, deaths among young children have decreased over the years in great part to poison centers’ accessibility to the public and their efforts to provide public education and sound the alarm on the dangers of household products and medications. Currently, the majority of poisoning fatalities result from medication overdoses in adults. Many poisonings are preventable and expert help is just a phone call away. Poison control centers save lives and health care dollars. The Nebraska Regional Poison Center is staffed by experienced, nationally-certified registered nurses and physicians who provide immediate assistance to health care providers and the public regarding the treatment of poisoning exposures 24 hours a day, seven days a week. More than 75% of poisoning exposure cases are managed at home, greatly reducing the need for a costly emergency department visit. Program the toll-free number for the poison center (1-800-222-1222) into your cell phone or text “poison” to 797979 to save the contact information for poison control. Be sure to read and follow medicine labels every time. Never take larger or more frequent doses of your medications to try to get faster or more powerful effects. Remember to always use the dosing device that comes with the medicine container. Check medications’ active ingredients, especially when taking more than one product, to avoid taking the same medication twice. For example, acetaminophen (Tylenol) can be found in a variety of fever reducers, pain medications, cold, and flu medications. Taking acetaminophen too often or at too high of a dose can cause liver damage and other toxic effects. Store all medicines out of reach and sight of children. Be aware that children are at risk when guests bring medications into your home. Dispose of all unwanted and expired medications. The poison center can direct you to the nearest location to dispose of them. Carbon monoxide (CO) is a poisonous gas with no color, odor or taste. Nebraska has one of the highest CO fatality rates in the U.S. A functioning CO detector should be located near all sleeping areas and on every level of your home. Be aware of where the disc batteries are in your home. They may be found in remote controls, key fobs, watches and toys. These batteries have caused fatalities in children. Laundry detergent packets (pods) are convenient, but also attractive to children and toxic when ingested or rubbed into eyes. Be sure all cleaning materials are stored in original containers and up and out of sight of children. Never mix household products together. For example, mixing bleach with acid-containing cleaners or with ammonia can result in toxic gases. Flavored refills for electronic cigarettes contain high concentrations of nicotine, which can be fatal to children if ingested. 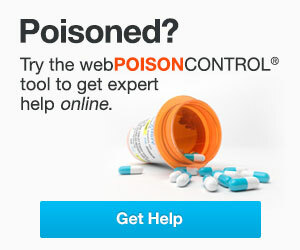 Call the poison center 1-800-222-1222 before you head to the emergency room for a poisoning. Your call is free and confidential. You will speak with a Registered Nurse or Pharmacist. You will be given expert advice 24/7/365! Your call is free and confidential. dizziness. Always keep a CO detector in your home. Antifreeze: Antifreeze is available as radiator antifreeze (often contains ethylene glycol) or windshield wiper solution (contains methanol). Both are highly toxic substances. The colors and sweet taste may be attractive to young children. Keep antifreeze products out of the reach of children. Always keep antifreeze in its original container and stored in locked cabinets. Halloween: The Nebraska Regional Poison Center wishes you a happy and safe Halloween. Listed below are Halloween tips for parents with youngsters. Check treats thoroughly before allowing children to eat them. Check wrappers for holes, tears and signs of rewrapping or tampering. Throw away unwrapped candy or fruits if the source is unknown. Be watchful of glow sticks and jewelry. If one breaks, avoid skin, mouth and eye contact. If your children use make-up rather than a mask, watch out for possible skin irritation, such as a rash or itching. If this occurs, remove the make-up immediately and thoroughly cleanse the area with soap and water. Dress children in light-colored clothing, short enough to prevent tripping and apply reflective tape for added safety. Carry a flashlight after dusk and watch for cars. Try to finish before dark. An adult should accompany young children and Halloween visits should be limited to familiar, local neighborhoods. Make sure children can see well enough through facemasks to prevent falls. Dry ice can be used in punch bowls but should not be used in individual glasses. Frostbite can occur if skin comes into contact with dry ice.